The Cake House Christmas 2012! 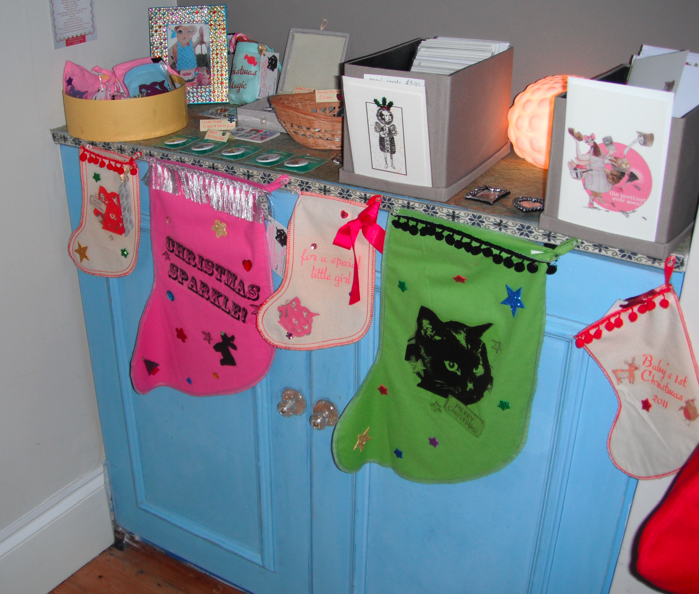 Well it’s nearly that time again, and the Brighton Christmas Open Houses open this weekend from Sat 1st December! I will be part of two houses again for Christmas 2012- they are The Cake House (37 Cleveland Road, Brighton) and Art @ number 73 (Stanmer Villas, Brighton). Both near Fiveways area and have free parking outside! 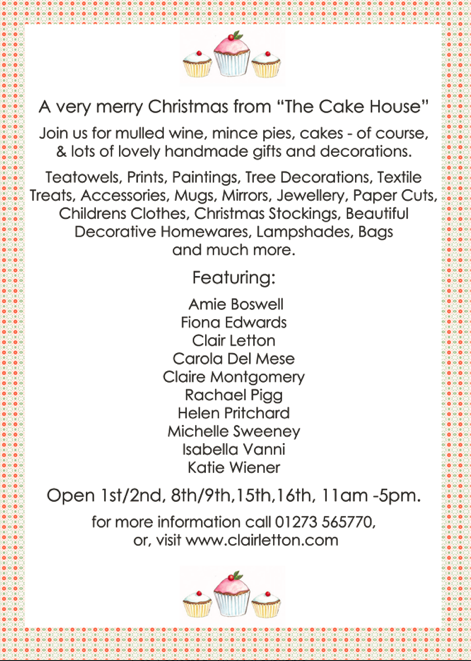 Here is the flyer for The Cake House- as those of you who have already visited will know it is one not to be missed. Famous for its quirky rainbow stairs and beautiful yummy cake Clair Letton’s house is full of festive crafty creations and a warm welcome! 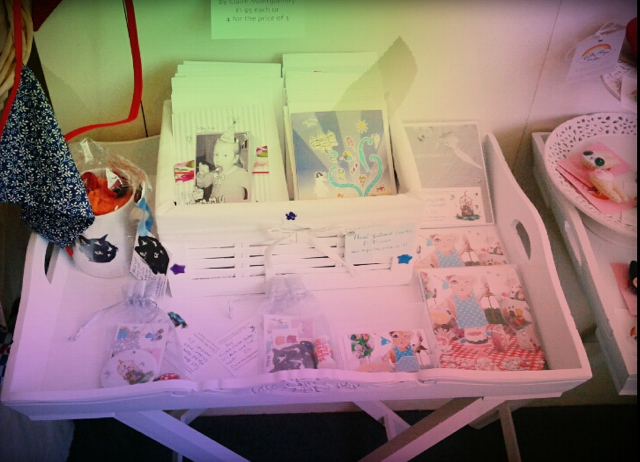 Come along and find jewelley, mixed media paintings, cushions, kids clothes, accessories, hair pieces, cotton bags, greeting cards, stockings, lampshades, bags and much more! 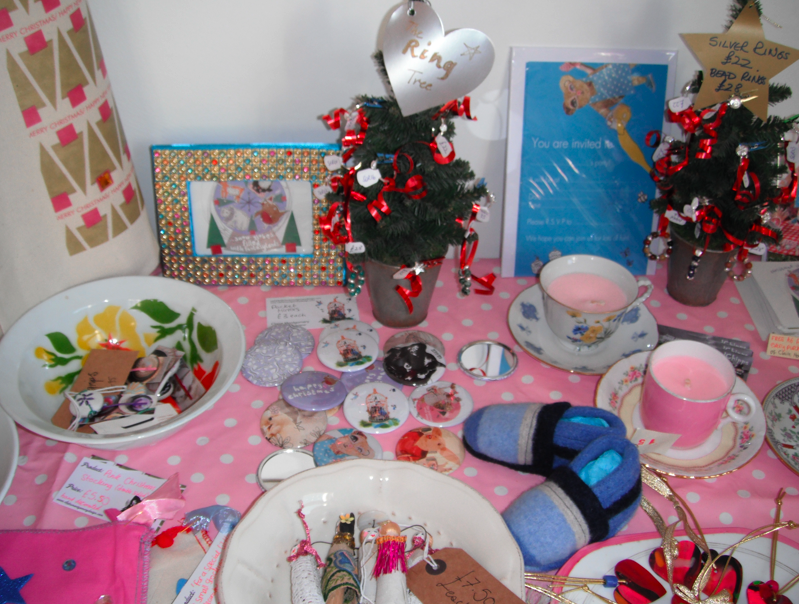 We hope you can make it- we are open 11am-5pm Every weekend from Sat 1st Dec- Sun 16th Dec, find us at 37 Cleveland Road, Brighton (opposite Blakers Park, Fiveways Trial). I will be selling a range of laser cut jewelley, earrings, tree decorations, phone charms. 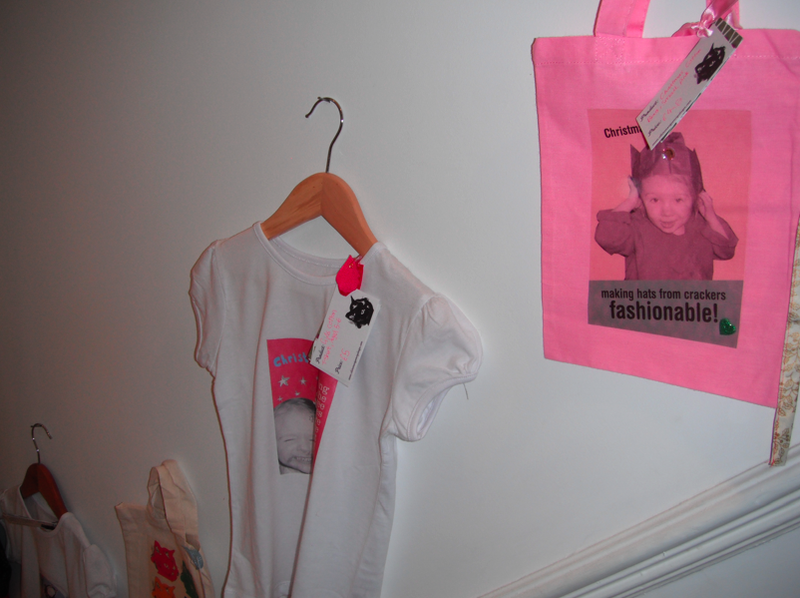 As well as greeting cards, cotton bags, small stockings, pocket mirrors, badges and much more. Please don’t miss us this Christmas- its a one off opportunity to get some wonderful handmade gifts you won’t find on the high street! I will be sitting in on Sunday 2nd Dec (this weekend) and Sunday 16th December- hope to see you there! What do you all think of this? 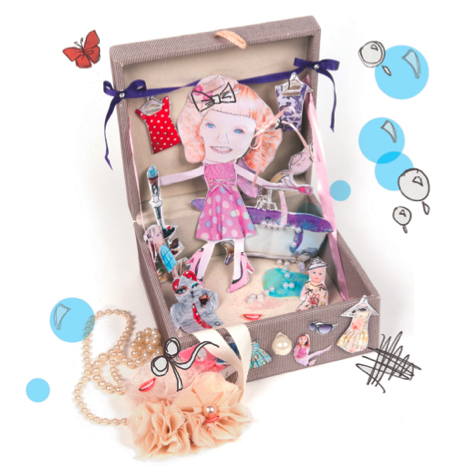 I was asked by the lovely Ilona Drew, of I Drew This, to take part in her flick ‘n’ mix blog- where three illustrators take part to create the head, body and legs then Ilona puts them together and we see what weird and wonderful creations we get. 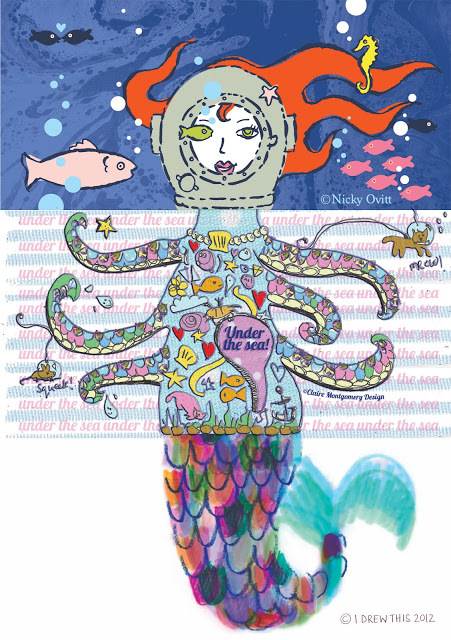 This weeks theme is under the sea and this is what we got…. Taking part also this week was Ilona (tail) herself and Nicky Ovitt (head). I created the body. 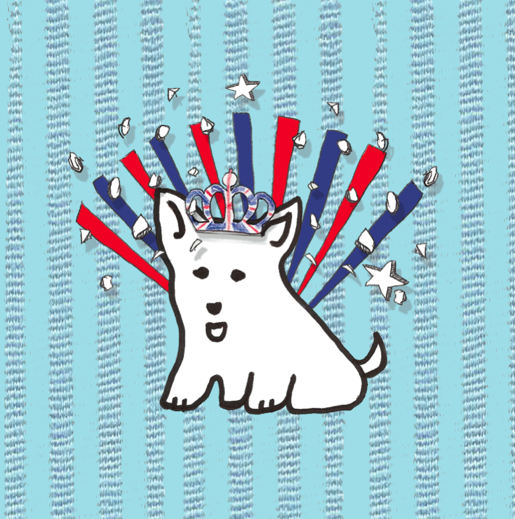 I think this is a fab idea for a blog and am proud to of been asked to be part of it! This advert makes me smile! Following on with the ‘cats with thumbs’ slogan of the last Cravendale ad, this advert focuses on the cats trying to take over the world and basically ‘catnap’ all the milkmen! 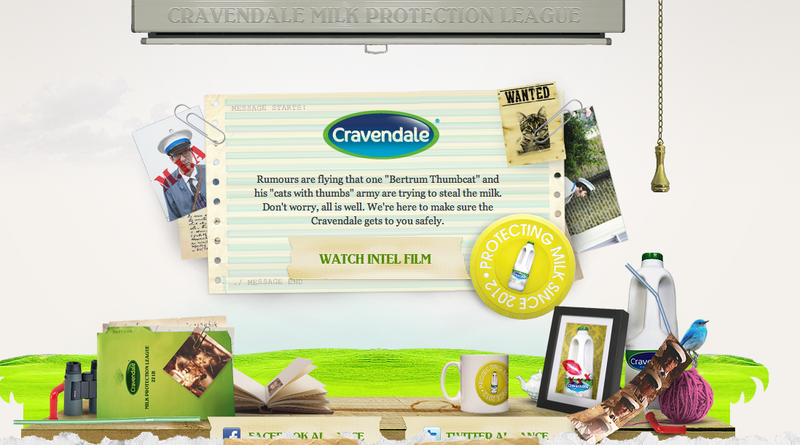 If you haven’t seen the advert yet, watch it here at milkmatters.co.uk. 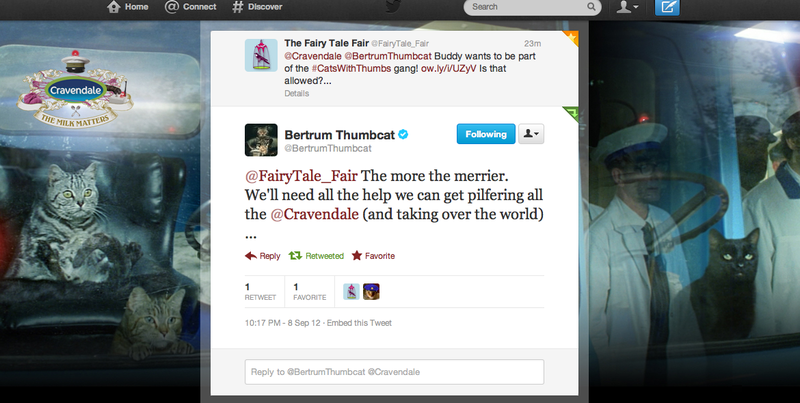 I even got a reply from Bertrum the cat himself on Twitter (via my Fairy Tale Fair account)! I sent a pic of my cat Buddy, who of course wants to be part of the cats with thumbs gang- and according to Bertrum he is in the gang! And yes I am excited about talking to a fictional cat on Twitter! Bertrum the Cat replies to me on Twitter! 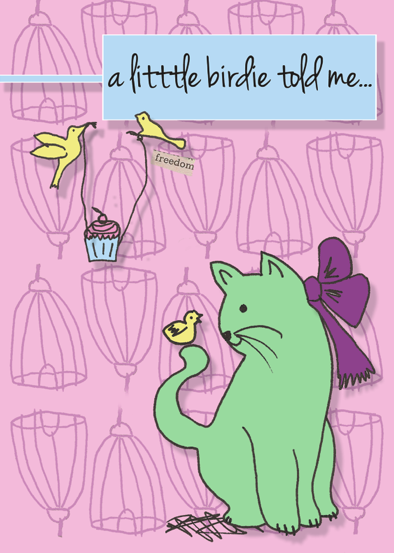 If you’d like to see the full range and more card designs view my Greeting Card Gallery. 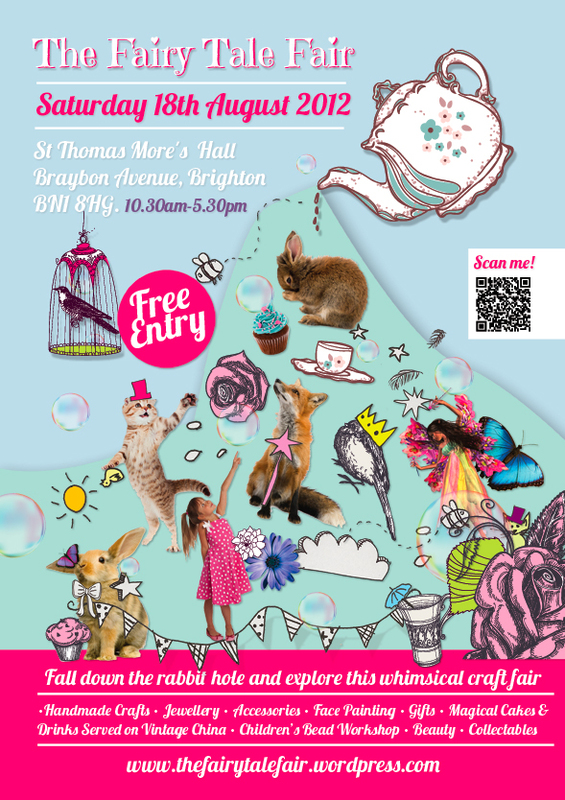 Announcing The Fairy Tale Fair, a craft fair I am organising and part of coming to Brighton in the summer! 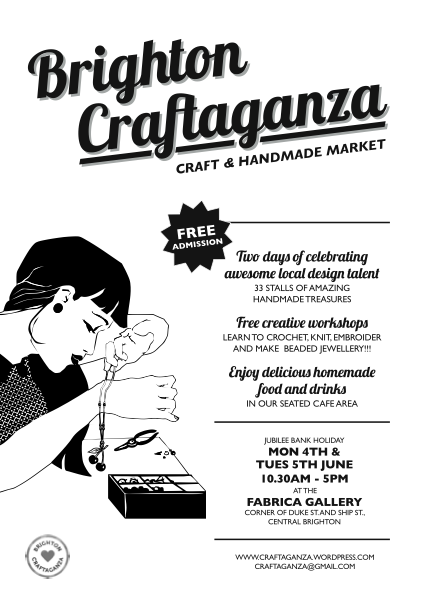 The summer craftaganza is finally here! 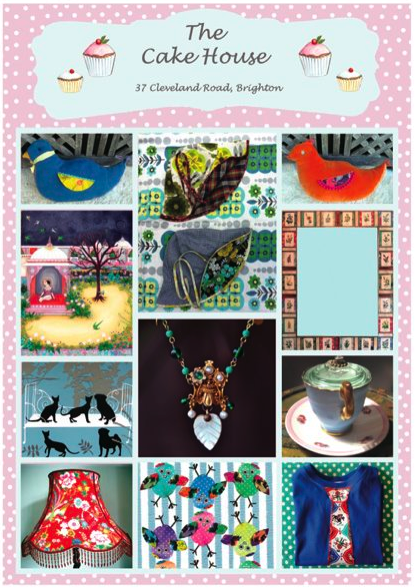 Situated on the corner of Ship & Duke streets in central Brighton in Fabrica gallery it provides an excellent location for a craft fair. The fair is open for two days from today with a range of sellers across the two days. I will be there tomorrow, Tuesday the 5th June, so why not pop along! 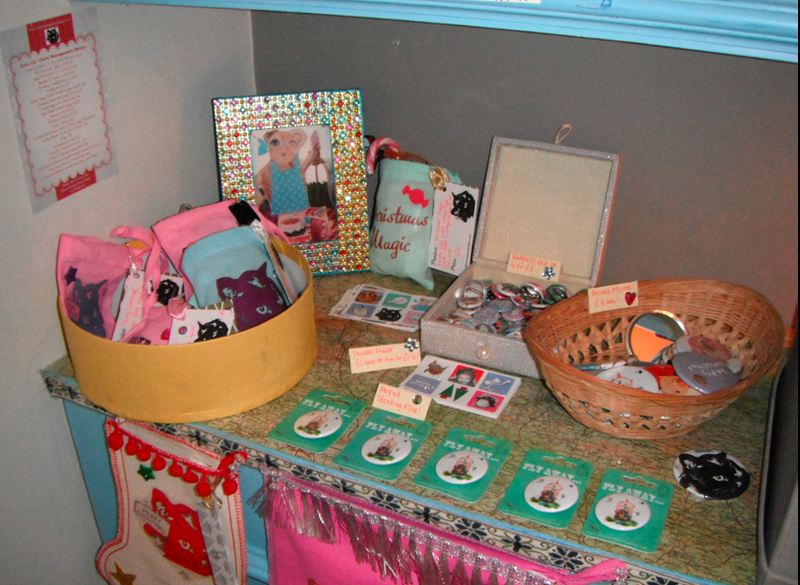 New pocket mirror gift sets in their own little keepsake bags. Hand glittered greeting cards available in over 50 designs- only £1.95 and 4 for price of 3! These as well as cotton bags, stickers, badges, gift sets and more will be available at Tuesdays Craftaganza- hope to see you there! See the Craftaganza blog here. See my featured post on the Craftaganza blog here. 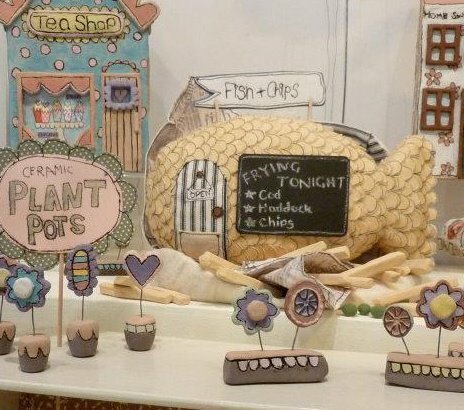 Well the Artists houses are over and all packed up for May 2012- thanks to everyone who came along to The Cake House and 73 Stanmer Villas, was much fun! 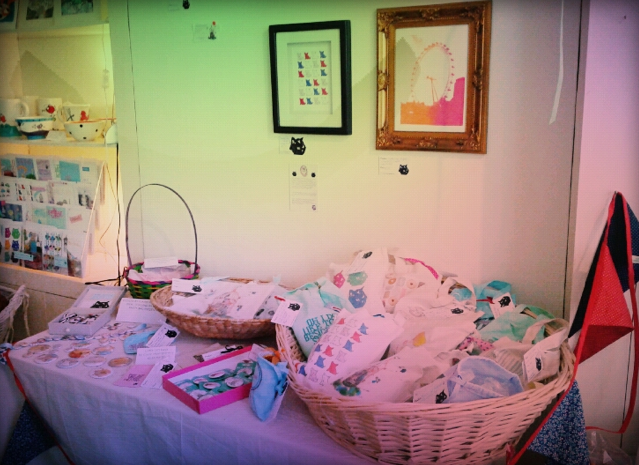 There was lots of lovely crafts, cake and local artists! Badges and cards seem to sell particularly well! Look forward to doing it all again at Christmas!! 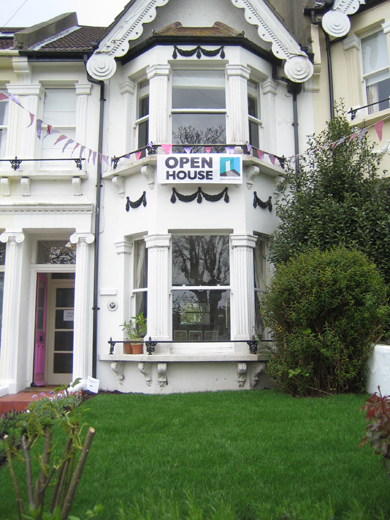 This weekend sees the last weekend of the Artists Open Houses in Brighton. 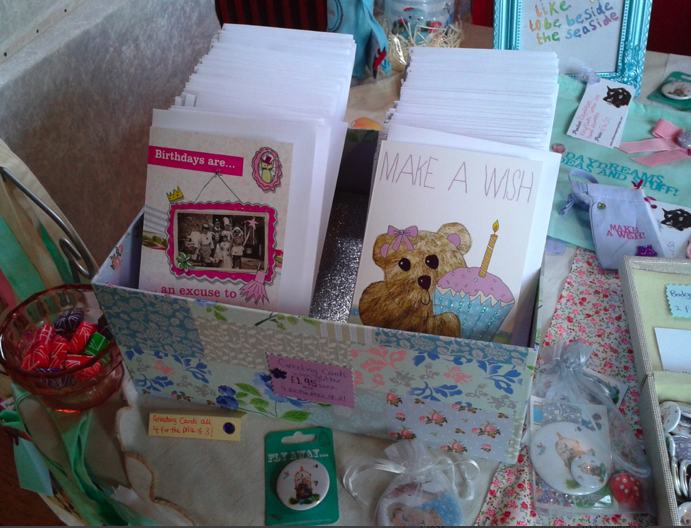 I will be at The Cake House, 37 Cleveland Road, Fiveways Brighton, all day tomorrow from 11am. Why not pop along and see me? 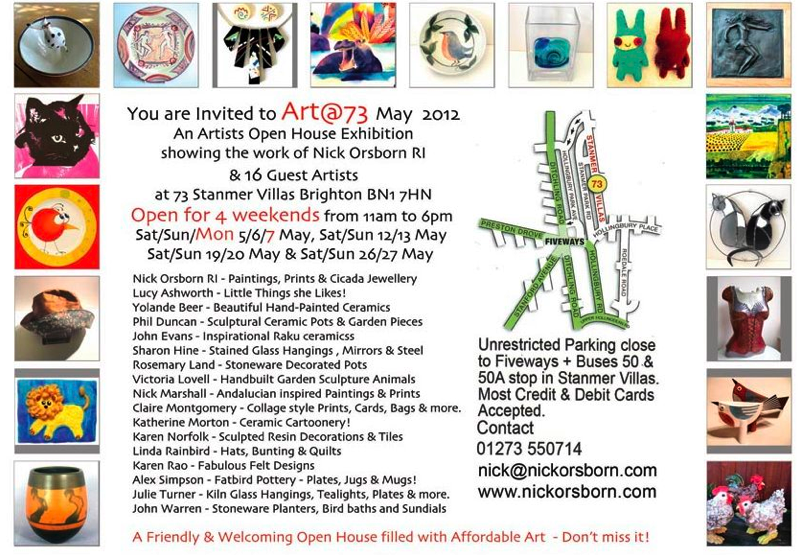 You can also see my work at Art@73, 73 Stanmer Villas, Brighton (also near Fiveways area). Both houses are open from 11am Saturday and Sunday and are full of wonderful artists! This is your last chance to see local artists work in such a wonderful and unique setting and meet the artists themselves. See the AOH page for full details. Hope to see you there! 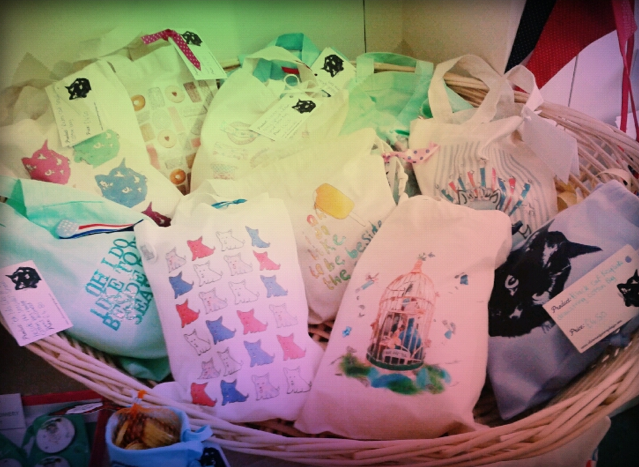 Small cotton bags- all hand printed and decorated. 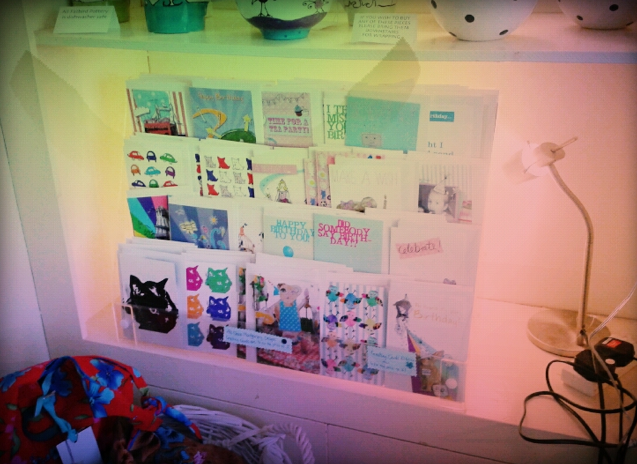 Greeting cards- all 4 sided colour print. Only £1.60 each AND 4 for the price of 3! 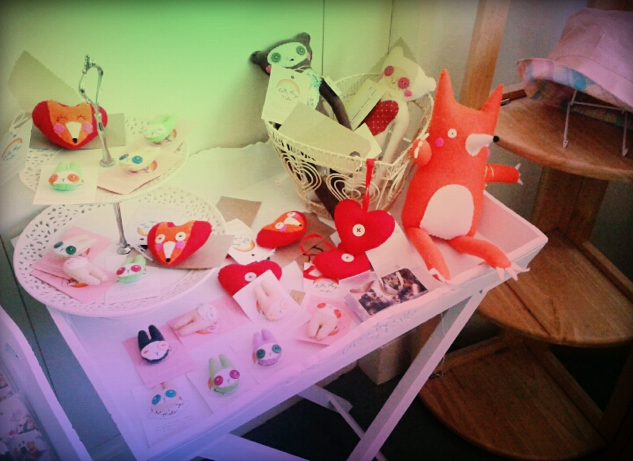 Lucy Ashworth’s wonderful fox creations! 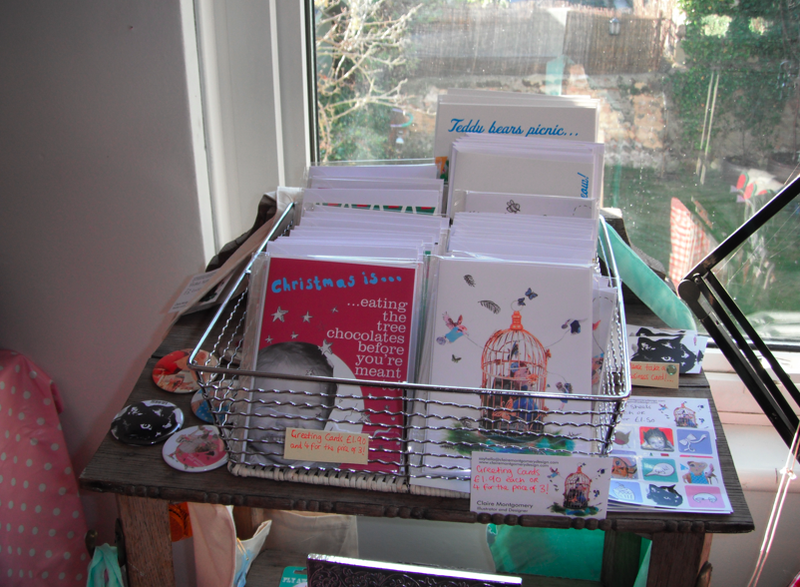 73 stanmer Villas, Brighton (BN17HN) is open today 11-6, and next Saturday and Sunday also. Visit to see over 16 artists and their lovely work! 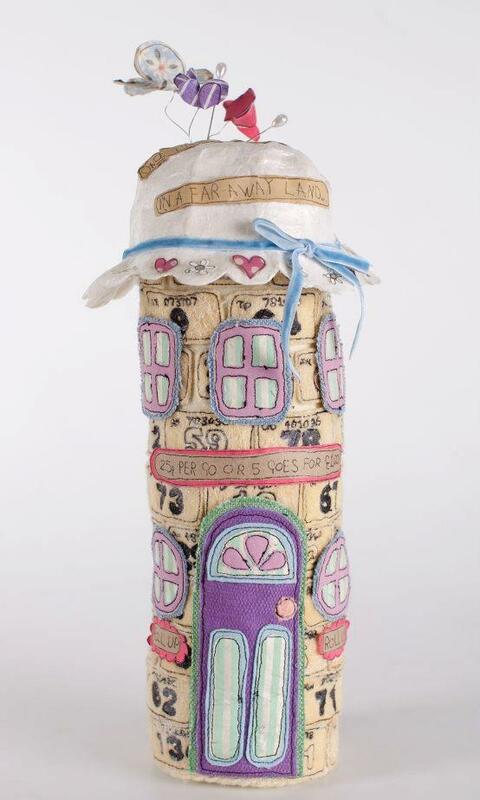 It is number i34 and page 80 in the Artists Open Houses brochure and is located near Fiveways area! 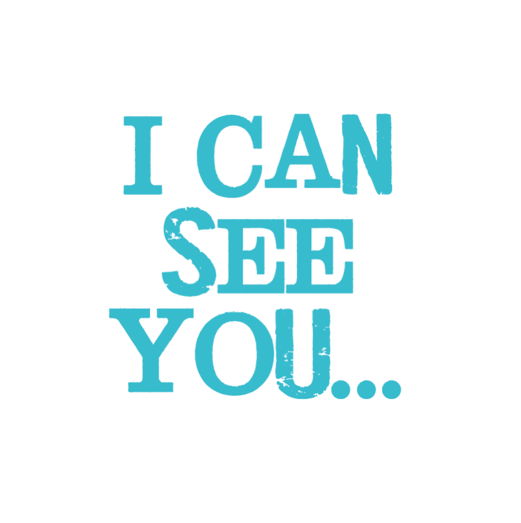 Why not take a peek….? 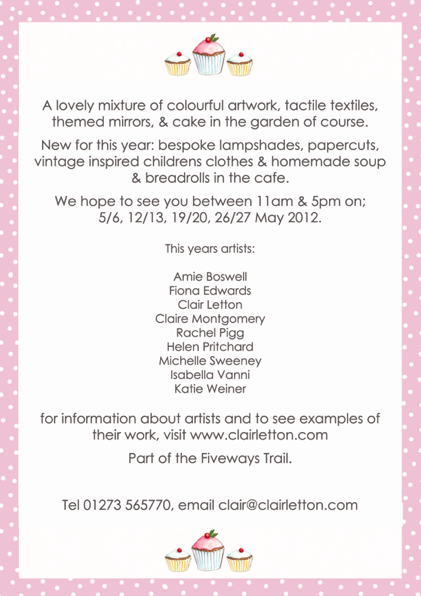 As well as number 73 Stanmer Villas I am part of another artists open house for May 2012, The Cake house (37 Cleveland Road). The house is full of wonderful gifts, including beautiful paintings, prints, mirrors, cushions, lampshades, paper cut outs and more. As well as lots of yummy cake of course in the cafe. 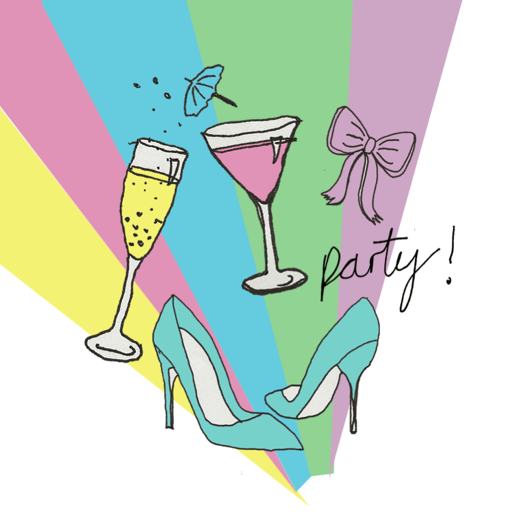 The house is welcoming, family friendly and full of colour and glitter. There is something for everyone so please pay us a visit! Open from this Saturday the 5th May and all weekends throughout May. See the AOH page for full details. Hope to see you there! 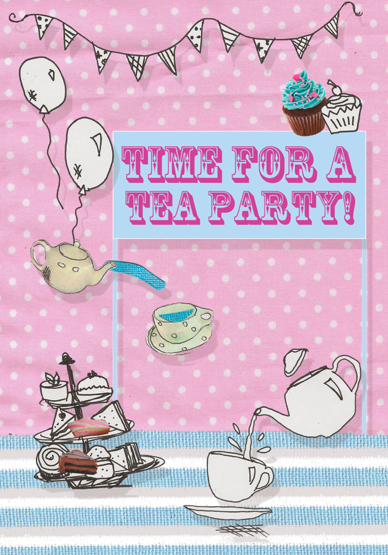 Available as a print, greeting card, badges, pocket mirror and cotton bags now! 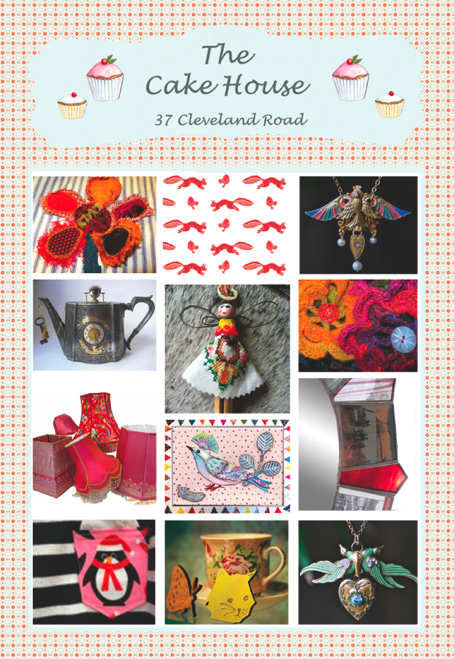 Find them at the artists open houses, Makers Boutique (2nd June), and Summer Craftaganza (Bank Holiday Tuesday 5th June). 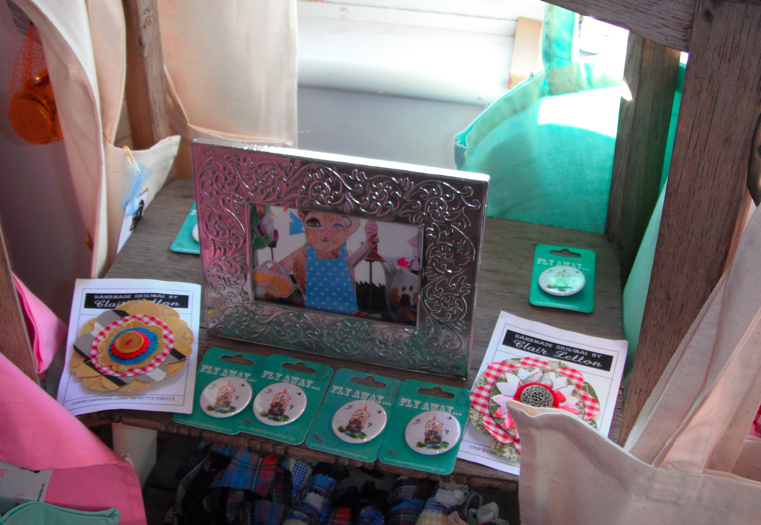 My new designs of pocket mirrors and badges have arrived are were available at Craftaganza yesterday. They will also be available at Makers Boutique (New Road, Brighton) on April 7th and the artists houses in May (see events page for details). 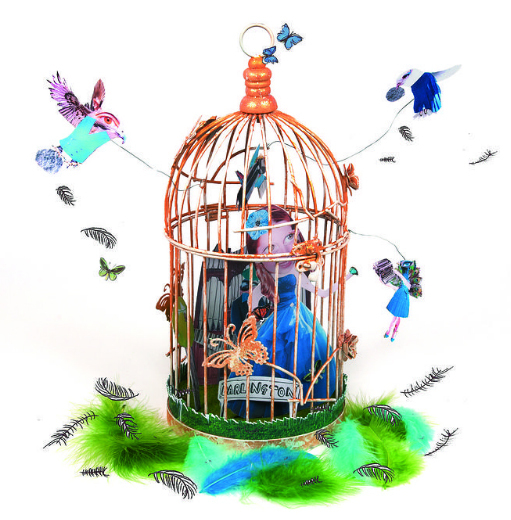 ‘What Little Girls Are Made Of’… 3D collage illustration I created last year as part of a book of nursery rhymes. 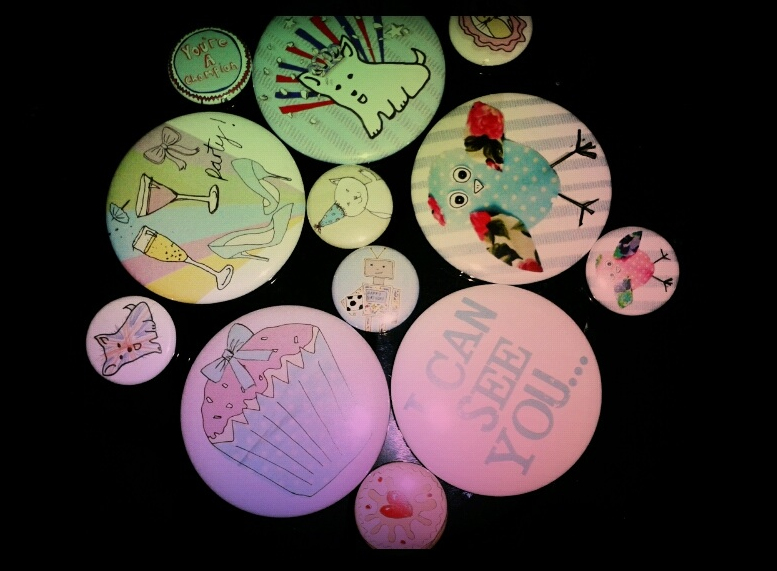 Some designs I sent off this morning to be printed as pocket mirrors. These will be new designs to add to my mirror collection so far. I will post photos when they arrive! 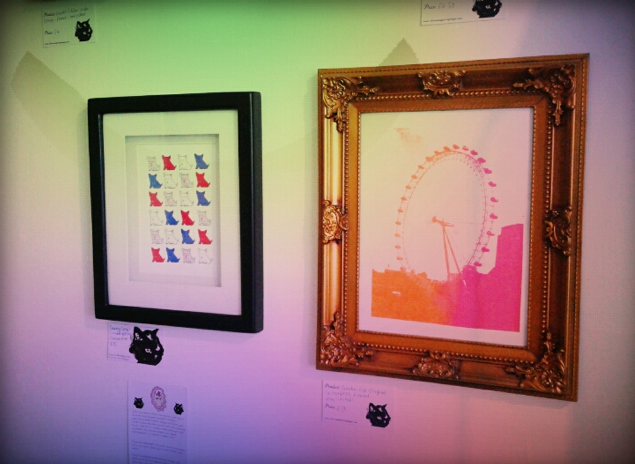 They will be available to buy at the Spring Craftaganza in Brighton. All little girls should have a yummy birthday! 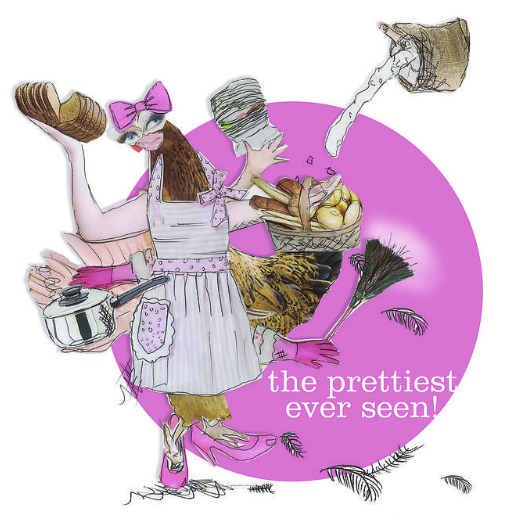 This is part of my ‘Away with the Fairies’ girls card range. 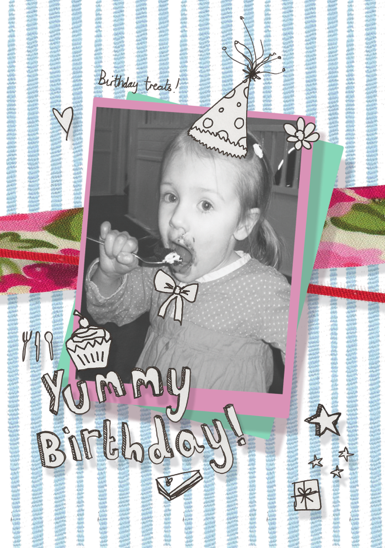 It features a photo of my niece, who is three today! Happy Birthday Ava! 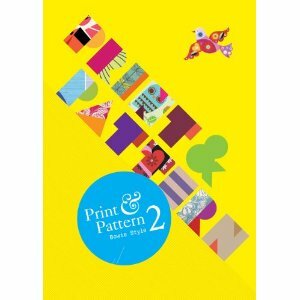 After getting the first Print and Pattern book in the summer I knew I had to get the second one when it was out. And I finally got it and it arrived at the weekend. 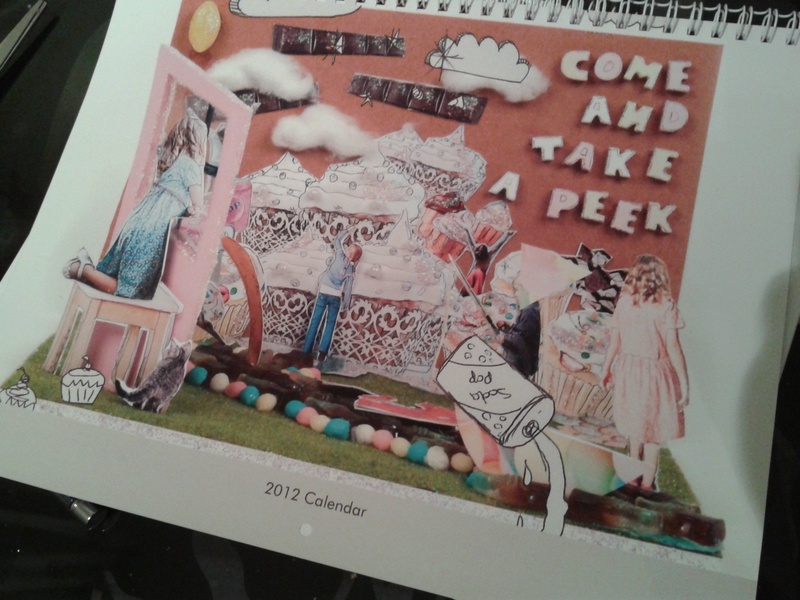 It has so many inspiring pieces in it and is full of lovely crafted bits. I will post some of my favorites soon! 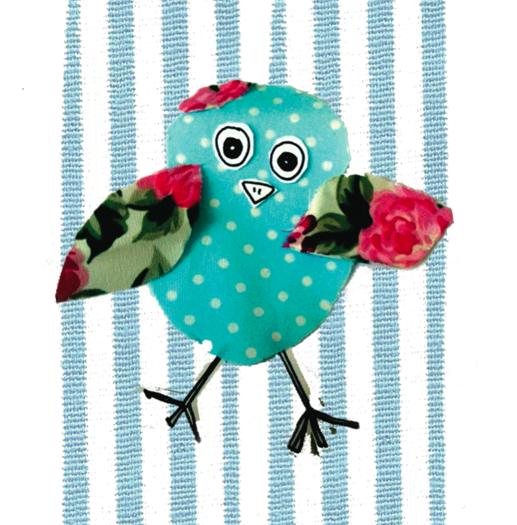 In the mean time take a look at the print and pattern blog here. 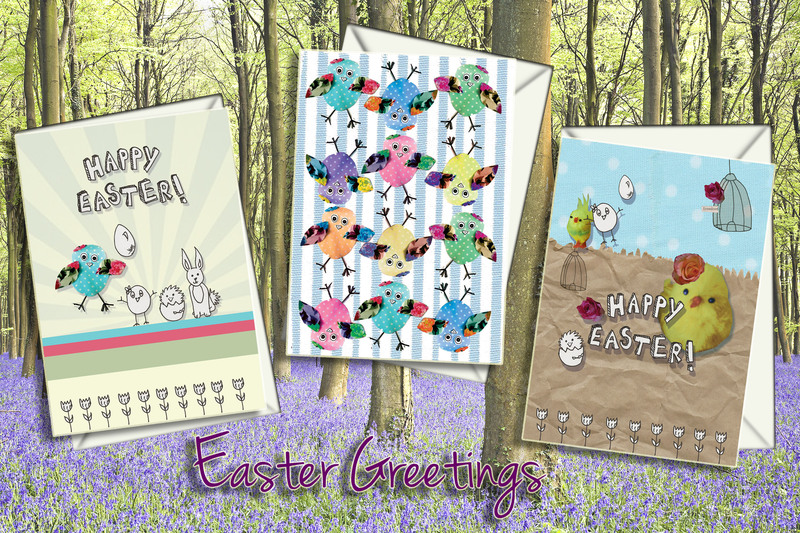 Here is a few easter designs I have created. The style is handcrafted collage, finished digitally. These cards will be available soon. 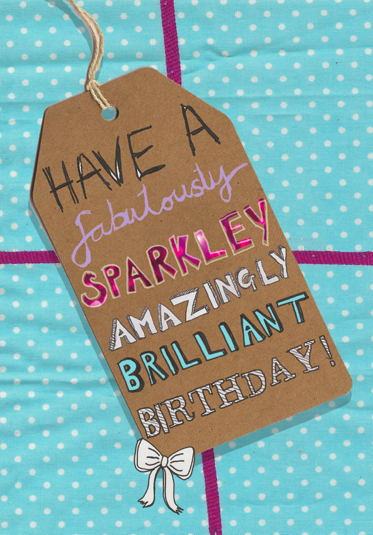 To purchase you can email me at sayhello@clairemontgomerydesign.com. 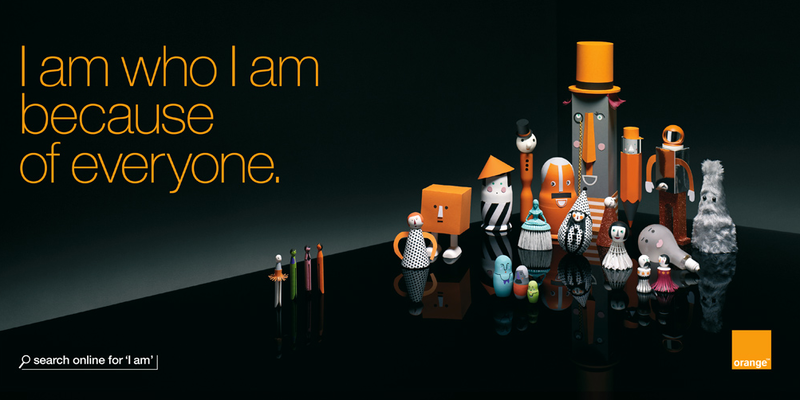 They will also be available at Brighton Craftaganza at Fabrica gallery on March 24th 2012, and across Brighton (details soon). 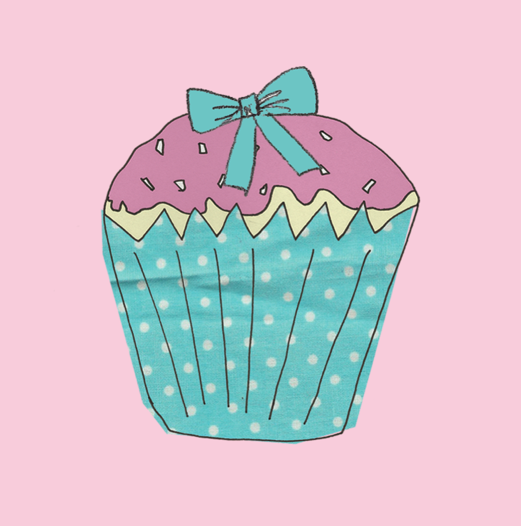 This design is part of my ‘Have Your Cake and Eat It’ female greeting card range. It is part of a range of 6 which will be launched soon! Keep a look out for them! 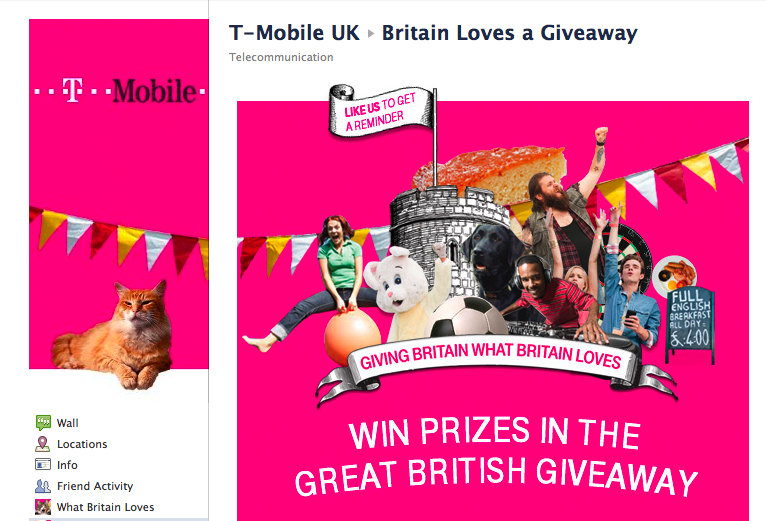 This is the branding for a new T-mobile add- What does Britain Love? I love this random collage style. View the ad on YouTube here. The Facebook branding is also nice, I like the cats! Then again, I always like cats! I’m sure this is the start of many British themed adds this year but it made me smile all the same! I thought I’d share another artist I am inspired by. Chrissie Macdonald is a unique collage illustrator, and she creates detailed 3D scenes as her collages. They are made almost entirely from only paper. 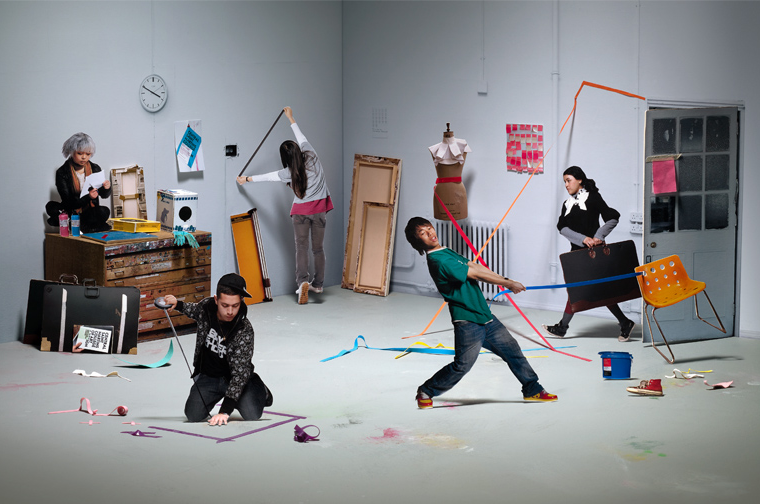 I came across her work as I was researching for my final project at uni last year. I love the detail and individuality to them! 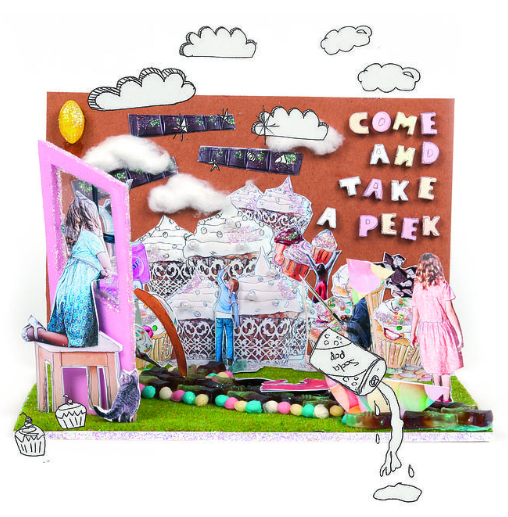 Some 3D collage scenes I created for a book of nursery rhymes last year…. The girl and the birds. They were all created by hand, made as scenes and photographed then sketches added on screen. Wanted to share this lovely work with everyone by artist Flossy Teacake. I came across her work after she liked my Facebook page and I love it! It’s so detailed and delicate and I love the vintage feel to it. 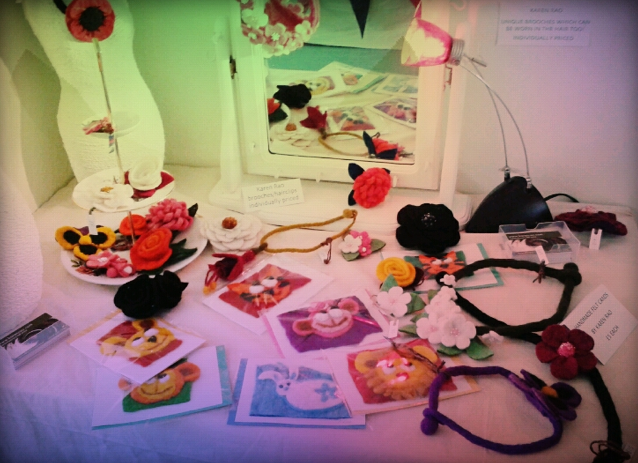 It’s also nice to see someone else who loves handmade stuff like me! I want it all! Take a look at her website by clicking here! 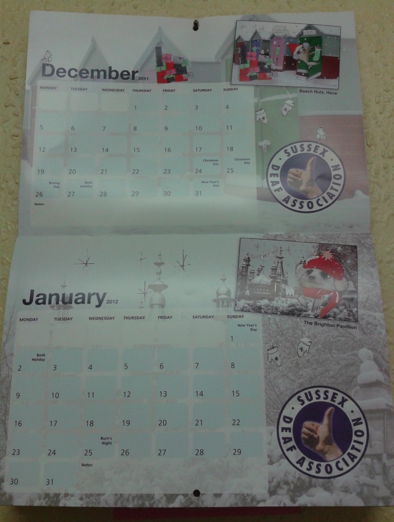 The 2012 calendar I designed for the Sussex Deaf Association Charity, this one is currently hanging in my Kitchen, hopefully there is 1,000 more hanging on other peoples walls! 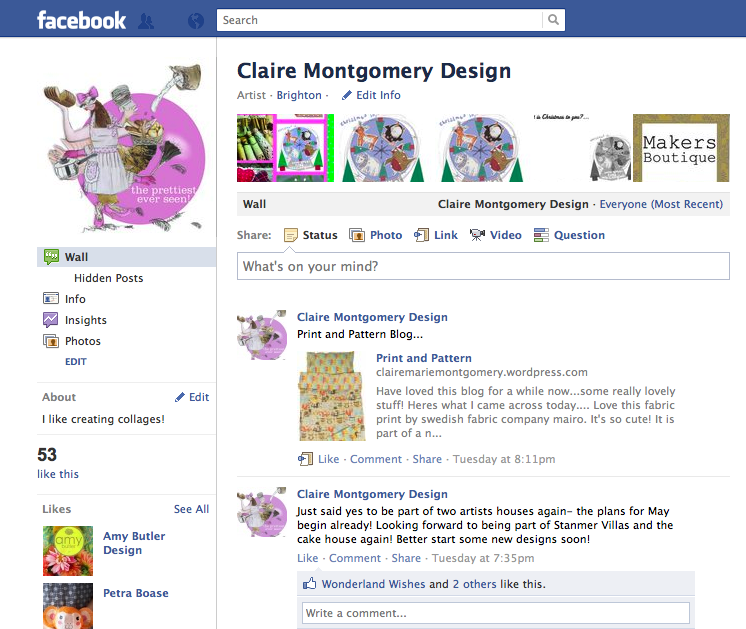 Please keep liking my Facebook page everyone! I promise I’ll make it interesting and keep it updated! 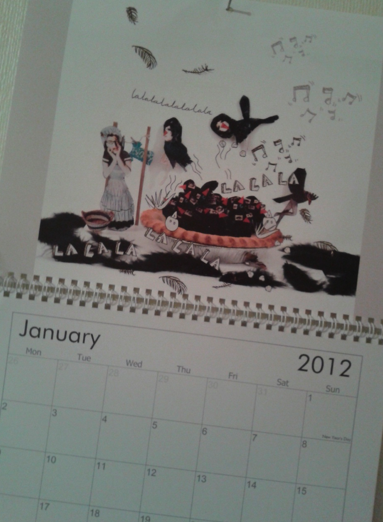 The Cake House Artist House- Now Open! 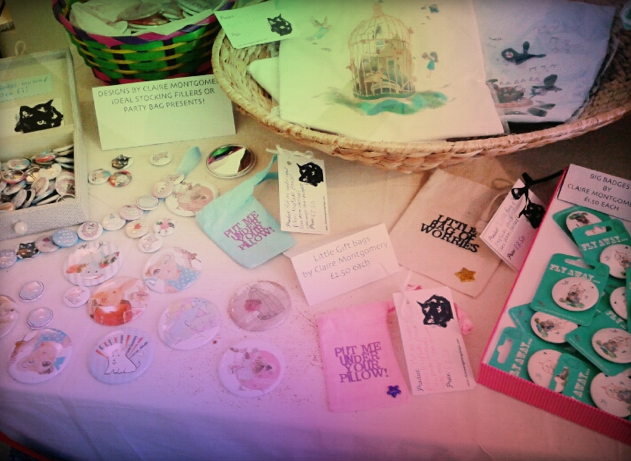 Table of bits and bobs with my pocket mirrors. 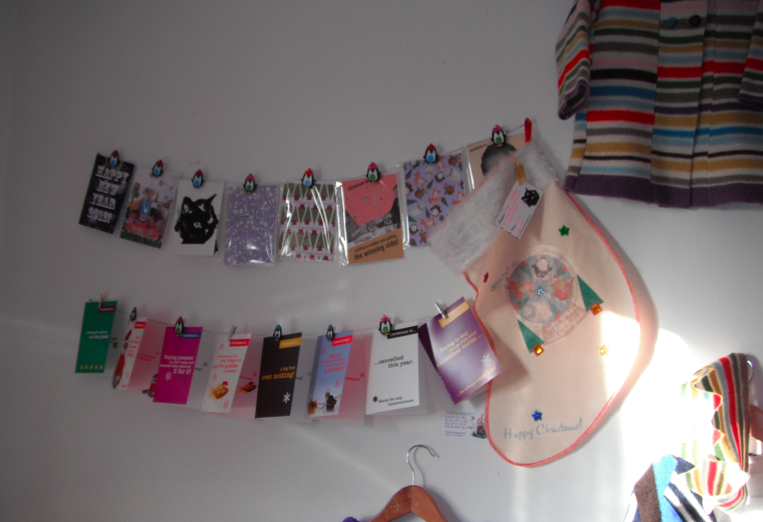 Cards Hanging and one of the stockings. 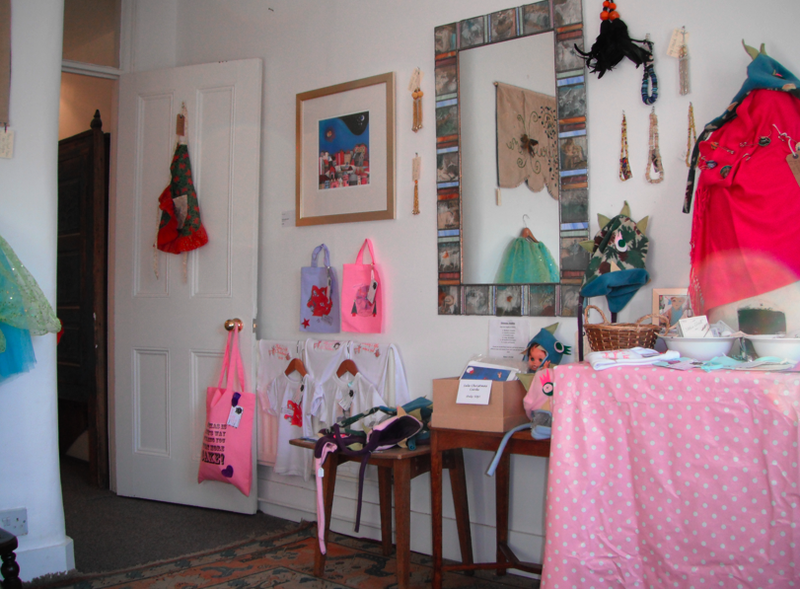 The upstairs room of lovely things! 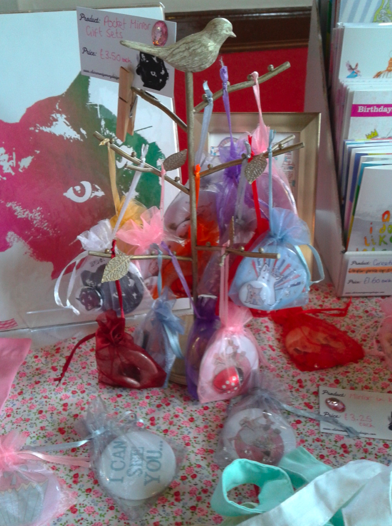 If you haven’t already done so please visit the Cake house at the weekend! All details on flyers in previous posts. Number 37 Cleveland Road Brighton.